A view of the components. 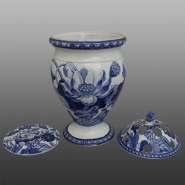 A potpourri pot printed in blue in the Water Lily pattern also known as Lotus or Waterlily . The Water Lily pattern was originally engraved in 1808 for printing in brown with enameled decoration. It was first made with the "botanical" border. However, the pattern was expensive and difficult to make. In 1811, Josiah II gave instructions that it should be removed from display, saying it would be reissued in blue with an altered border. The resulting pattern was one of the finest of the period and it enjoyed a long life. The center pattern consists of three flowers: 1) Sacred Lotus of Buddha, 2) Starry Water Lily and 3) Lotus of Egypt.